A year ago, experts revealed that 57% of marketers believe that SEO has the biggest impact on lead generation. By 2015, Perform Insider reported that on average, conversion rates are 10 times higher from search compared to traffic from social media. Another report from B2B Marketing last year revealed that every month there are more than 10.3 billion Google searches. From this, they found out that 78% are U.S. internet users who are researching for products and services online. These figures are enough motivation for many small businesses to keep their SEO campaigns thrive especially in an industry wherein big brands always dominate. SEO in 2016: Why You Should Keep On Innovating? Unlike other marketing tactics, SEO’s dynamic doesn’t depend on one formula alone. In fact, it’s constantly evolving nature makes it difficult to standardize. The need to keep yourself up to date with the latest changes in search technology is a major aspect that can help you create an effective search engine optimization plan that can withstand the test of competition and of course, the test of time. To survive and thrive in SEO in 2016 and beyond, one should keep in mind the importance to constantly innovate. Thus, to help you prepare what lies ahead in SEO for the year 2016, we bring you the list of game changing trends which top industry experts predicted to shake the landscape of search marketing next year. When it comes to SEO, even the thought leaders and experts in the industry can’t agree on the same thing. Everyone has their own opinion, findings, researches, and data that somehow back up their conclusions. Let’s take a look at what the prominent SEO personalities and online marketing experts foresee on how SEO trends can change the landscape of the online marketing industry next year. This might be a big revelation to some, but for those who keep a closer watch on the day to day changes that have been happening in the search landscape, this is something like a given. The time has come that ranking on top of the SERPs is not the only way to gain organic traffic. How does this come to this? Is this the end of search engine optimization? The introduction of Google’s different layouts for their search result pages paves way to this game changing dilemma. This forces everyone to rethink their optimization strategies. The need to have a different tactic for each of the SERPs layout such as local pack and paid ads pack is now getting more important. Does this mean that SEO is going to end? Of course not. The thing is, there’s more demand now to optimize content for search as opportunities to gain visibility increases. Mobile is expected to surpass desktop usage by 2016. This prediction is backed up by studies and researches that show how mobile phones become the widely used gadget in browsing the web. According to a survey, search is the most common starting point for mobile research wherein 48% begins on search engines. With these data, there’s no excuse anymore not to optimize your website for mobile platforms. If your website is not mobile friendly, you’ll lose a significant chunk of traffic that could have surely help you increase conversions and sales. According to Jeff Bullas, businesses should start to have a mobile mindset for all their website and product based decisions. The need to consider how their content would look like on mobile platforms should be taken into account when finalizing their website, product pages, service pages and layouts. So, why is this a game changer? Those who haven’t switched to mobile yet must now adapt, or else, their competitors can steal the traffic and audience that are supposedly theirs. The need to increase the conversation rate of your webpage is necessary if you don’t want to waste potential prospects who you failed to convert. According to Keith Hodges, this can be done by using a sophisticated web tracking tool such as Google Analytics. This can help you understand how to get prospects convert faster especially those with shorter attention span. Why is this a game changer? If you are too focused on SEO, there’s a big chance that you will not try CTO because you are already contented with the results of the former. But, for those who fully know how to maximize their resources to increase successful conversions, CTO can help them narrow the lead of their competitors. The traffic that your SEO hasn’t captured, your CTO will. When it comes to return of investments for B2C industries and brands, Jayson DeMers, in his article in Forbes, believes that video content will overtake written content in 2016. If realized, this is definitely a game changer especially for brands who have never ventured to video content before. Jayson explained that although written content is still considered the standard format by vast majority of content producers, video is expected to overtake it by next year mainly due to the fact that a handful of new technologies such as Vine, Periscope, Snapchat, and other apps are partially responsible in setting user expectations toward more visual content. He further discussed that with this trend the real herald may come from Google, the company that is currently experimenting with video ads in search results. Why is this trend a game changer? Marketers or businesses especially those who have been optimizing written content for search engines need to slowly adjust starting from now and carefully make way for videos in their content marketing strategy. Those who won’t make a move might lose their potential prospects to their competition. Definitely not new, right? But, if your page speed is still as slow as a snail, then you better find ways to fix it. Internet users are impatient and demanding prospects. They will abandon your page with no second thoughts if they find your page laggy. In fact, many unsuccessful conversions are caused by poor page speed performance. Link Assistant also emphasized that page speed is a search ranking factor. Those websites that load quicker can surely outrank those ones that don’t. Also, it is worthy to note that slow loading pages are difficult to crawl and index. Thus, before you proceed with your SEO campaign, make sure first that your content is plastered on a page with excellent speed. Why is this a game changer? Web savvy small businesses now have the opportunity to compete against big brands that are still relying on traditional means to promote their products or services. This means that if the latter won’t adapt to this trend, they will surely lose their edge and their competitors will have the chance to outrank them. Although Google never owned up that they use social signals in ranking web pages, many studies performed by known experts showed otherwise. According to 93 Digital, links will remain important, but mentions via social media will become more relevant and next year, their relevance will be as equal to those of links. Why is this a game changer? If you have already built a name in social media, getting mentions from popular platforms won’t be that difficult anymore. But, if you just recently tried your luck in there, even if you are a big brand, you definitely need to work harder to gain trust, and loyalty from your audience. Gone are the days wherein simplistic SEO approaches such as keywords and links are the only major factors in ranking webpages in search engine result pages. According to Link Assistant, user behavior factors affect rankings. They said that Google may have denied this finding, but this just not just mere speculation because this is backed up and proven by many experiments done by industry experts. Why is this a game changer? Despite the fact that Google hasn’t owned up yet that they are using this as part of their ranking algorithm, it is always an advantage on your part to put this factor in consideration. Getting a step ahead from your competition can always give you an edge which can help you stay on top of search rankings game. There are 5 new elements from users’ behavior that you need to focus on to get better understanding on how you can put your content on top of the SERPs: Click-through rates, Engagement, Information that fills gaps in searcher’s knowledge, Loyalty per visit, and fulfilling the searcher’s task. Read the more detailed explanation for each element here. Probably the latest challenge search engine optimization experts now currently face. The rise of voice search would force businesses to modify their SEO strategy to fit the demand of this technology that is now embraced by many. According to Jeff Bullas, keywords used in text-based search is quite different from the keywords used in voice search. For example, when someone looks for the address of Home Depot, he would only type “Home Depot” to find its location, but in voice search, the searcher has to say “Where is the nearest Home Depot?” Jeff emphasized that with this new trend, businesses should focus on how the search began and how questions (from voice searches) define the changing patterns in mobile devices. Why is this a game changer? Those who don’t adapt to this technological change will lose in the mobile arena. If your target audience are mostly active in mobile, then you should rethink your SEO strategy now before your competition will own it. In 2016, experts predict that the industry will see the real time Google Panda algorithm updates in full swing. Business2Community.com said that it will be updated and rolled out by the end of December, thus next year is the time wherein businesses can fully utilize their resources to adjust their search optimization strategies according to the newest algorithm rules. Why is this a game changer? No one fully knows what are the specific changes and add-ons that Google will employ in the next Panda update. That fact alone can affect how everyone in the industry would implement their SEO campaigns once the update will be fully rolled out. This is somehow related to number 6, but this one is more visible and has already been confirmed by the search giant themselves. If you have noticed recently, every time you do searches in Google, more especially if it has do with news related topics, tweets from Twitter and posts from Facebook are already showing in results pages. This only means that next year, businesses should expect that more and more social media content will be crawled and indexed by search engines. So, why is this a game changer? Those who have invested more in social media for this year would surely be rewarded more next year. But, if you are still having second thoughts in jumping into the social media bandwagon, then it’s up to you. You just have to know that if you want to compete and get a lead advantage, you should always be proactive and should know how to jive in with the trends. Getting organic clicks doesn’t mean you only need to get on top of the SERPs. Mobile optimization is a must. Conversion Rate Optimization should complement your SEO efforts. Search optimization for video content should not be put aside. Page speed is a very important search ranking factor. Social media mentions will become equally important as links. Prepare your SEO strategies for Voice Search. Full Roll-Out of a new Google Panda Update. Invest more in social media now so that you won’t be left out next year. Of course, these trends are not expected to fit to all types of business. You pick some or a few of these ones that you think can help you out in staying ahead of your competitors. My forecast will not be complete if I did not include natural link building. Instead of me having to write a complete article I want you to read Why Manual Link Building Will Never Be Obsolete, by my mentor and Good friend Eric Ward. 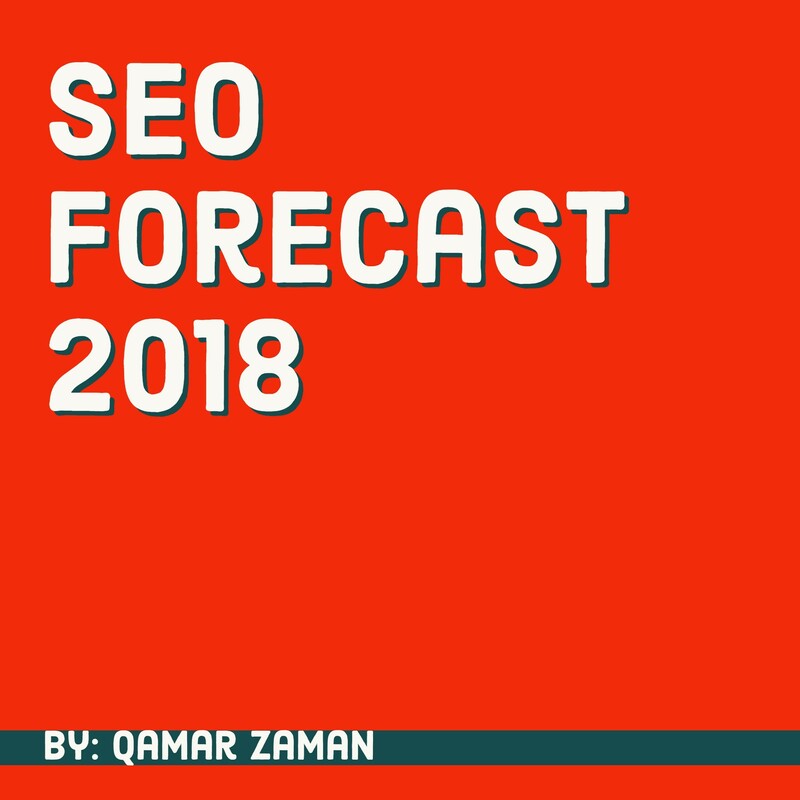 Qamar Zaman is a Dallas based SEO professional & Founder or Submit Press Release 123 and OneSECompany.com who has spent over 2 decades learning the art of SEO from some experts that include. Eric Ward, Bruce Clay, Neil Patel & many others.